There may be other cities with more tech start-ups and life sciences companies than Pittsburgh. But few areas can match the Steel City when it comes to the combination of scientific and healthcare assets available at UPMC, University of Pittsburgh and Carnegie Mellon University that are producing groundbreaking advances in technology and medicine, said Dr. Farnam Jahanian, provost and chief academic officer at CMU. 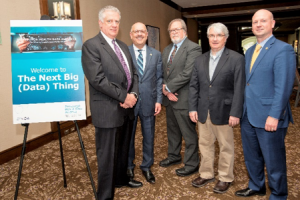 “Pittsburgh’s concentration of expertise, innovation, and investment puts us in a unique position to accelerate the data-driven future of heath care, an area where CMU technologies will play a leading role,” Dr. Jahanian said April 18 during the opening presentation for “The Next Big (Data) Thing,” an event hosted by the Pittsburgh Health Data Alliance. 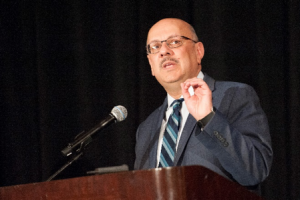 The Alliance, a two-year-old collaborative partnership between one of the nation’s biggest integrated health systems and two of Pittsburgh’s premier universities, hosted the event to provide stakeholders and the community with an update on its progress. Established to accelerate the transfer of innovation from lab bench to bedside, and foster Pittsburgh’s burgeoning technology community, the alliance is helping university researchers turn their ideas into successful digital health companies. The Alliance builds on the strengths of each institution. UPMC and its commercialization and investment arm, UPMC Enterprises, provide funding, entrepreneurial know-how and access to expert physicians. Pitt’s medical school and its researchers are at the forefront of research in medicine and bioengineering. And CMU is renowned for its advancements in data science and machine learning. 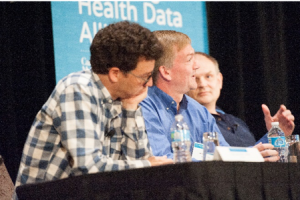 At the center of the partnership is health data. “Without data there is no discovery. 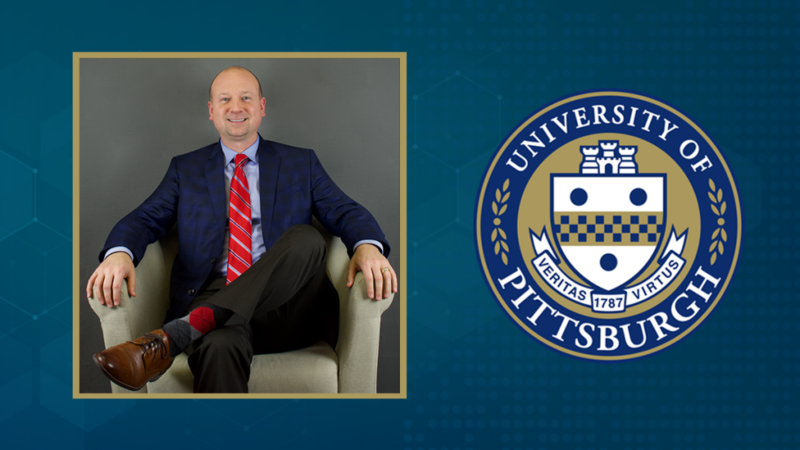 And without discovery there’s no innovation,” said Dr. Don Taylor, Pitt’s assistant vice chancellor for commercial translation in the health sciences. Tal Heppenstall, executive vice president and treasurer of UPMC and president of UPMC Enterprises, opened the event, which was held at the Westin Convention Center hotel in downtown Pittsburgh, and told the invitation-only audience of about 200 people that the Alliance was unlocking the potential of big data to revolutionize healthcare and build an ecosystem of innovation. “Pittsburgh is a center for health technology in the country,” Heppenstall said. Since the Alliance was announced in March 2015, UPMC Enterprises has evaluated more than 100 proposals and funded 10 projects that seek to use health data to solve complex problems in healthcare, Heppenstall said. At the same time, the universities have created new research centers to focus their work with the Alliance. Pitt formed the Center for Commercial Applications of Healthcare Data and CMU established the Center for Machine Learning and Health. Dr. Joe Marks, executive director of CMU’s Center for Machine Learning and Health, lauded UPMC Enterprises not only for its funding but also for the commercialization assistance that is essential for success but often not available from traditional funding sources. “If you’re a successful academic at CMU, you may not have had the time to pick up the commercial experience,” Dr. Marks said. And the focus on translating research into commercial ideas is already laying the groundwork for success at Pitt, where university scientists have tripled the number of approved invention disclosures in the last two years compared with the previous nine years, said Dr. Michael Becich, co-director of Pitt’s Center for Commercial Applications of Healthcare Data. “I think we have come out of the gates strong,” he said. The afternoon event also featured presentations from 17 proposed or funded Alliance projects, covering focus areas that included Precision Medicine, Biometrics for Clinical Decision Support, Care Management and Coordination, Consumer-Driven Health, Health IT Devices, and Pre-and Post-Hospital Risk Management. Projects ranged from a computer model to predict tumor evolution to a system that detects mental health status based on facial expressions, and technology that better diagnoses swallowing disorders. Another project seeks to better understand a patient’s gastrointestinal health by analyzing unique sounds coming from the gut. 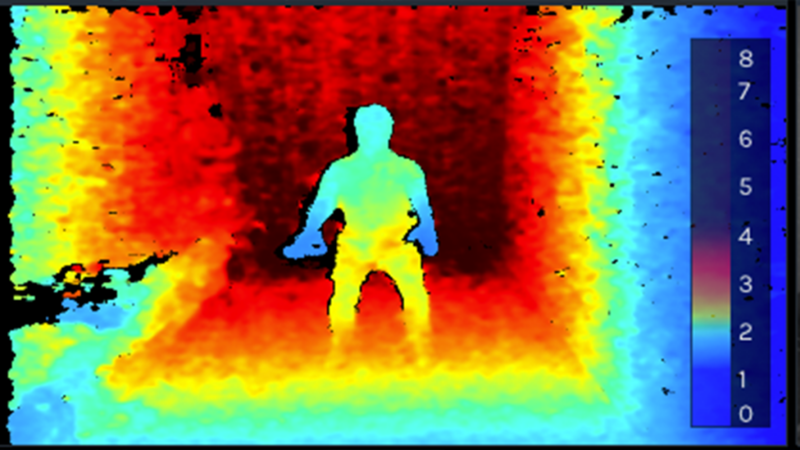 The research isn’t some pointless academic exercise; the technology could have significant real-world applications. For example, surgery patients are at risk for post-operative complications if their gastrointestinal systems don’t resume normal function. Knowing earlier which patients are having complications could result in better treatments and lower costs. Closing the event was “Pittsburgh: The Nation’s Beta Site,” which featured a panel of experts discussing factors that have led to the city’s emergence as a recognized technology hub. The panel included Dr. Andrew W. Moore, Dean of CMU’s School of Computer Science; Dr. Harvey Borovetz, distinguished professor and former chair of Pitt’s Department of Bioengineering; Dr. Jeff Schneider, the engineering lead for machine learning at Uber’s Advanced Technologies Center; Dr. Luis von Ahn, Co-Founder and CEO of language-learning app Duolingo; and Dr. Adam Berger, Executive Vice President and Chief Technology Officer at UPMC Enterprises. Dr. Berger, a computer scientist who previously founded two companies and worked for major technology companies Nokia and IBM, said he sees potential for technology to disrupt and improve healthcare. And with massive amounts of available data at UPMC and engineering talent in Pittsburgh, the chance to have a major impact on the industry has never been greater. “We’re seeing great opportunity with telemedicine,” Dr. Berger said, adding that the technology can extend the reach and efficiency of many medical specialists. Dr. Schneider said Uber chose to establish its center for autonomous vehicle research in Pittsburgh because the region offered unmatched access to talent, a high quality of life for employees, and supportive government officials.